Category Rules let PocketSmith do the heavy lifting 💪🏽 for you when it comes to getting your transactions categorized. With Category Rules, you're able to set up your PocketSmith account to automatically categorize transactions just the way you like. This means less time spent manually categorizing your transactions - yay! Category Rules work by matching a transaction's merchant name to the merchant keywords belonging to a Category Rule. If a transaction's merchant name has text in it that match the Category Rules' merchant keywords, then that transaction will be assigned to the appropriate category. Bridie shops at Betty's Liquor store for wine. She wants all her Betty's Liquor transactions to be automatically assigned to her 🍻 Drinks category. The trouble is, each time a new transaction comes in from Betty's Liquor, it often comes in with different details in the merchant name, such as, a different time, date, or card information etc. When Bridie sets a Category Rule for Betty's Liquor, she needs to pick out the best merchant keywords from the transaction in order for the Category Rule to be successful each time a new transaction comes in. In this case, the common merchant keyword for Bridie's transactions at Betty's Liquor is 'Bettys'. There are a few different places around PocketSmith where a Category Rule can be created for a transaction and where you can add a transaction's specific merchant keywords to a category rule. We recommend applying your category rules from the Categorize Items page or when editing a transaction because you can simultaneously edit the merchant keywords for that transaction. 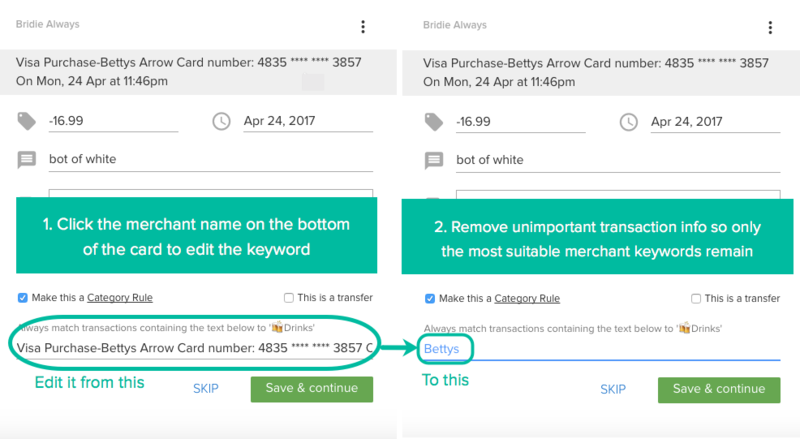 Based on the example above with Bridie's Betty's Liquor purchase, Bridie can adjust the merchant keywords so that it just contained 'Bettys'. When categorizing transactions from the Categorize Items page, you can add merchant keywords to a Category Rule so that similar future transactions are automatically categorized. When editing a transaction from the Transactions page, you can add merchant keywords to a Category Rule so that similar future transactions are automatically categorized. When categorizing transactions from the Transactions page, you can create a Category Rule for transactions so that similar future transactions are automatically categorized too. However, to edit the merchant keywords, you'll need to head to your Settings to edit the category rule's merchant keywords. To improve the Category Rules performance so that they automatically categorize more transactions, you will want to edit the merchant keywords or the order of your Category Rules. When you create a new category rule, it won’t run the rule against any existing transactions - only against new transactions that are imported to PocketSmith in the future. If you're creating a category rule via the Categorize items page (rather than on the Transactions page), PocketSmith will attempt to apply the rule to newly imported uncategorized transactions, but generally speaking, it won't apply them to existing transactions. However, you can force a category rule to run against your existing transactions! At the bottom of the list of merchant keywords you'll see a section Apply category rule to all matching transactions. This section will only show if there are transactions that match your category rule but are assigned to a different category, or are currently uncategorized. Selecting this option will apply the category rule to all transactions with matching merchants, even if they have been previously categorized to another category. Consider whether this is the right option for you! Category Rules work by automatically categorizing your transactions purely based on the merchant (or keywords within the merchant), of a transaction. Filters, on the other hand, can categorize your transactions based on multiple criteria, such as Merchant keyword + amount + specific account. Filters can also apply changes to transactions other than just assigning a category. For more detail on using filters please see Everything you need to know about filters.